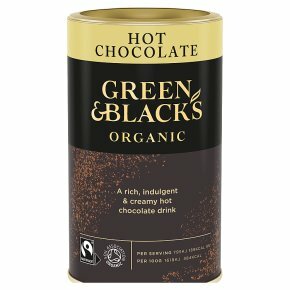 Made from the finest organic cocoa beans, our new hot chocolate has the cocoa intensity that you know and love. Suitable for vegetarians. A rich, indulgent & creamy hot chocolate drink Our organic hot chocolate is made with finest organic cocoa beans. These are harvested at the perfect point of ripeness, then carefully fermented and dried to maximise the smooth, complex flavours of this delicious cocoa. When mixed with hot milk, this drink delivers cocoa intensity and creamy indulgence with every mouthful. It is quite simply our chocolate, hot. To Enjoy: Put 4 teaspoons of Hot Chocolate granules into a mug, pour over 250 ml of hot semi-skimmed milk and stir. Alternatively, mix the granules with cold milk in a microwaveable mug and heat in an 800W microwave on high for 1 minute 40 seconds. Stir before drinking.